This entry was posted on December 3, 2018 by Don Roberto. With Christmas just around the corner, it is that time of year once again where some of us struggle to find the perfect gift for boyfriends, husbands, fathers, sons, uncles and any other special man in our lives. Let’s face it: men can be hard to find the perfect gift for! The good news is that Don Roberto is here to help with their men's watch buying guide! Don Roberto Jewelers has a wonderful selection of sophisticated men's watches that can compliment any look and sense of style. Matching function with timeless fashion, a watch can be the perfect gift. 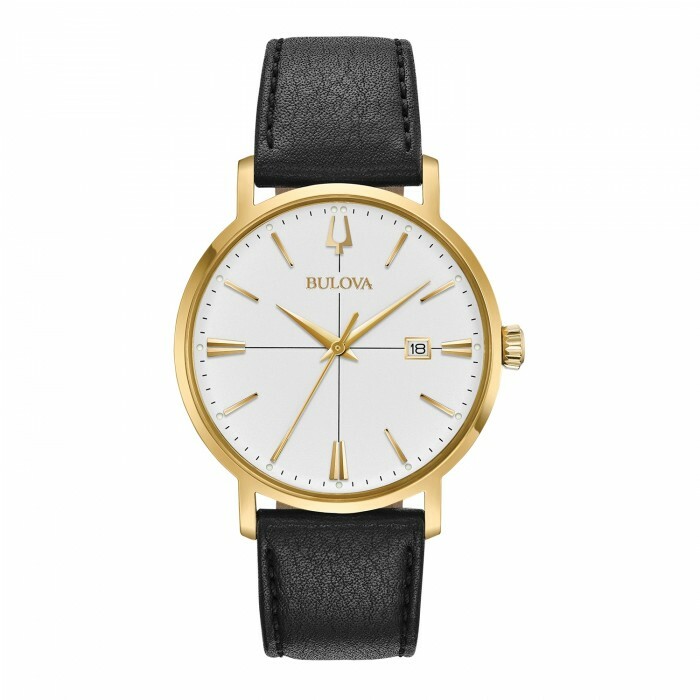 From the classic Aerojet Collection, this men's Bulova watch features a gold-tone stainless steel case, silver-white dial with gold-tone accents and three-hand calendar feature. The smooth grain black leather strap with three-piece buckle closure secures it. From the Marine Star Collection, this stunning blue, six-hand chronograph function with calendar, and gold-tone stainless steel case features are rotating dial ring to measure elapsed time. 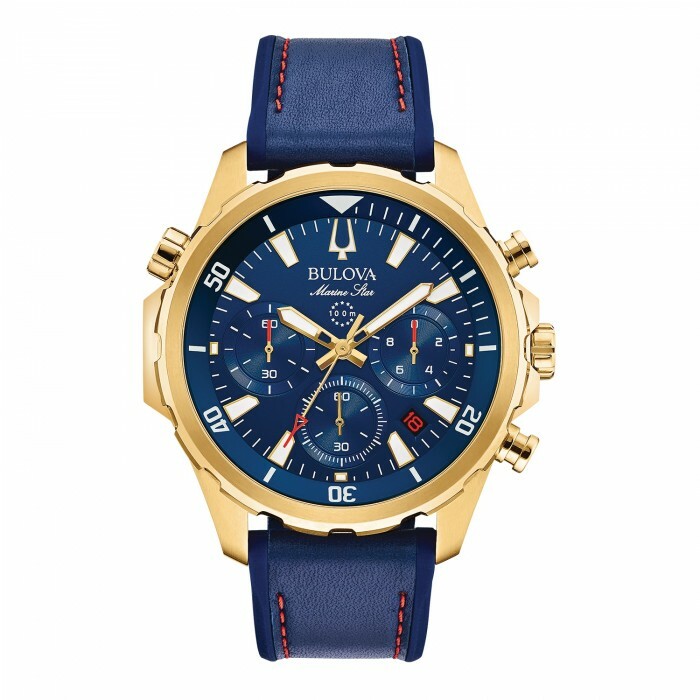 The blue dial features gold-tone accents while the flat mineral glass protects it. A blue leather and silicone strap with red stitch detail and three-piece buckle closure secure it. 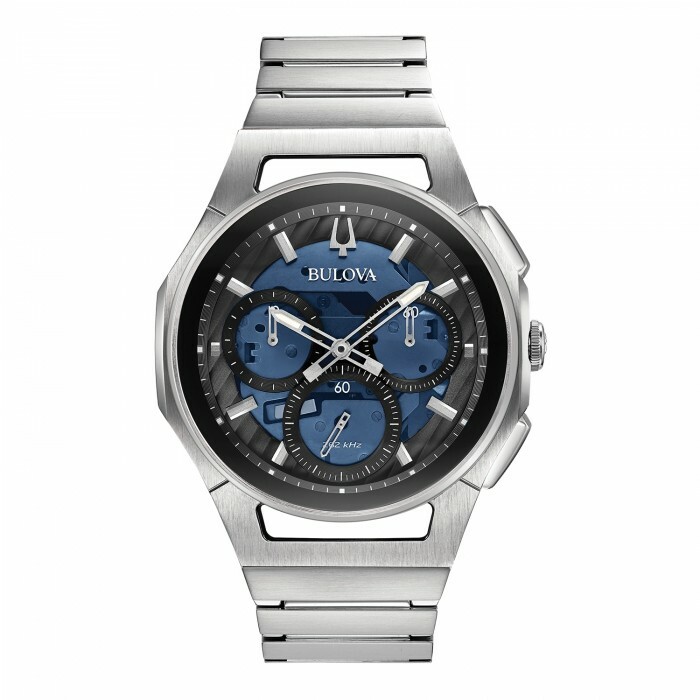 This men's Bulova watch from the Curv Collection is the world’s first curved chronograph movement. Featuring high-performance quartz technology and precise accuracy, this five-hand chronograph is featured in stainless steel with a dark blue dial, silver-tone hands, and markers. A stainless steel bracelet with double-press deployment closure keeps the watch safe and secure. 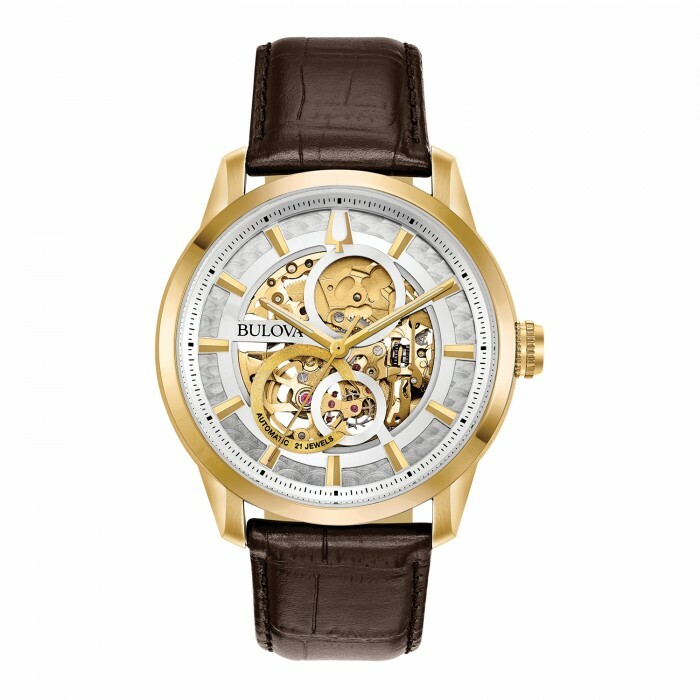 This men's Bulova watch features a sophisticated design with full exhibition dial and case-back. the gold-tone stainless steel screw-back case, skeletonized silver white three-hand dial revealing the intricate workings of the self-winding 21-jewel movement, makes this watch stand out from the rest. 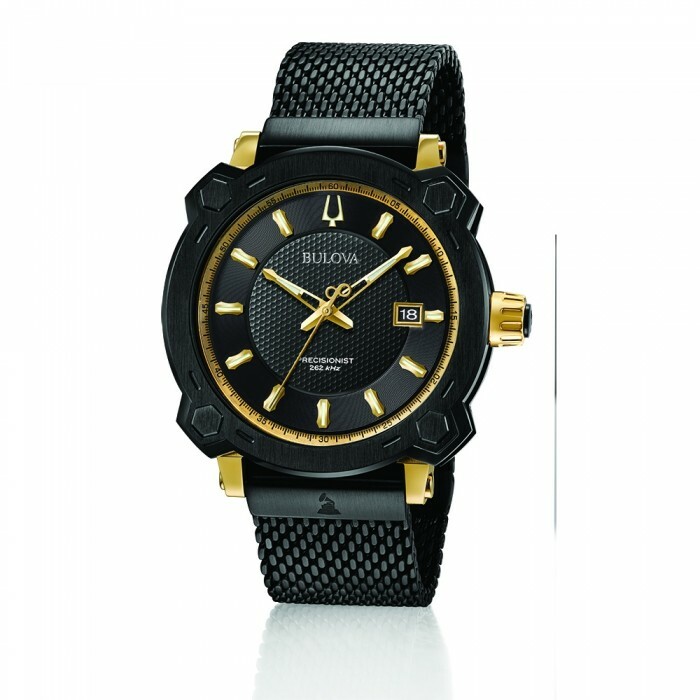 This stunning men's Grammy Edition Precisionist watch features a matte black ion-plated stainless steel case. the watch features a calendar and sweeping hand in yellow gold-tone. yellow-gold-tone accents can be seen on the case, bezel, and dial with a Grammy logo on the back of the case. These are just a few of our men’s watches that are available online and in store. Be sure to drop by one of our locations to see and sample the full collection of Men’s Watches we have in stock. If you are shopping for men’s jewelry and gifts, then Don Roberto can offer you some great options to choose from. We can help guide you through the process of selecting an ideal watch for that special man in your life. Contact us at [email protected] .